My daughter's breeding doe, Sugar, had ten kits on Monday, May 6th. One was so small and weak from birth that I knew it was unlikely to survive even though I fed it by hand with kitten replacement milk since it could not fight against its litter mates to get to mama's milk. Even though I know that in the wild, the bunny would not have survived, it still disturbs me to find one of them lifeless. Nature is not kind. In this kindle, there were two other kits that concerned me because they were not getting enough milk. This is how it goes typically when the kindle numbers more than seven or eight. There are about three that get super sized within the first three days as they gorge themselves with milk in their tummies—you can actually see a taunt, expanded area of white on their left sides! Then there are three that are not getting any milk or at least not enough. When we have twelve in a kindle I usually have to keep tabs on four or five of them like this. The others are medium sized. Contrary to thoughts of a cuddly, protective, and patient mother, the mother rabbit stays away from her nest. Even a full grown rabbit has no defense other than speed, so it is instinctive to not draw a predator's attention to the nest. The mother rabbit only goes into the nest to allow the kits to nurse once or twice a day; staying alert to her surroundings she squats over them as they become a frenzy beneath her. She is in the nest only for about five minutes. Everything with rabbits is about speed. I have tried pulling the mother rabbit out and letting the smaller babies nurse between times, but they were still not getting enough milk. The concern here is that if the mother rabbit feels too disturbed, her milk production could lessen and that seemed to be the case as even the larger ones were not getting as much. So I continued to hand feed the ones that needed it most. When this kindle was a few days developed so that they could be split and keep each other warm enough, I removed the largest for 24 hours so the smaller ones could get to mama. This may sound cruel, but in the wild the mother rabbit may not come to the nest for that same amount of time and some of the the babies starve even when she comes more often, simply because the stronger ones will force them away. 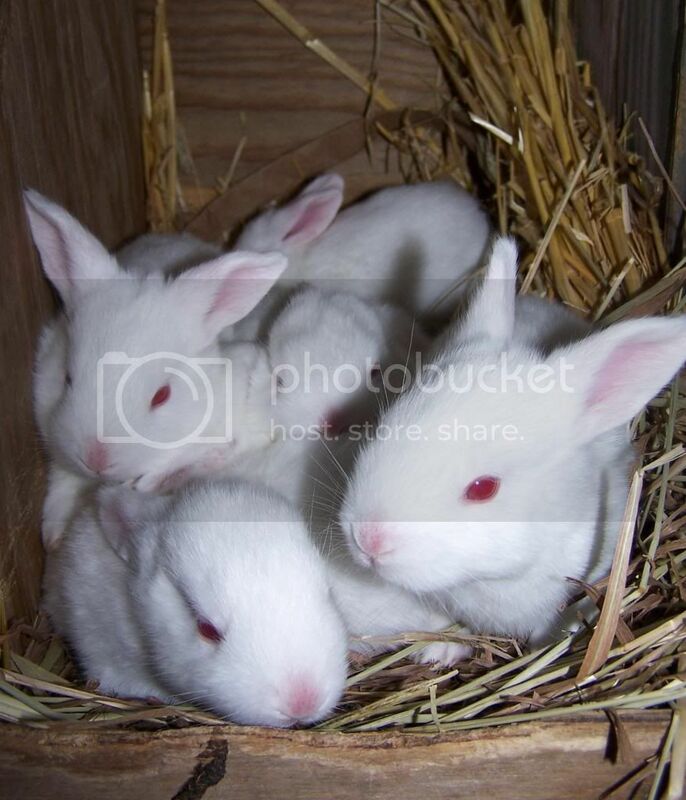 The practice of separating evens them up somewhat and the smaller bunnies do much better on the mama's milk. Still, that does not always work either. In this kindle, one of the two remaining small ones by then seemed too weak to nurse on his own so I had to hand feed it anyway. I try not to get attached but when I handle the little ones so much it is more difficult not to do so. My goal is just to get them to be about 11 days old when their eyes are open and they are able to go out of the nest to find the mother when they are hungry and they begin to nibble on hay. This works in a cage, but in the wild the mother would not be around and a too-curious bunny could be the undoing of the entire nest. Sometimes a hungry kit finally struggles through the others and gets latched on as the mama will hop out of the nest dragging the baby. Once the baby, still having its eyes close and not much fur, gets stuck outside of the nest without the rest of the kindle to warm him, he will get too cold very quickly. So strong is the instinct to stay away from the nest that the mama rabbit will even keep moving away from the strayed one, if it finds her to snuggle up against. In the winter, the kit can die in less than 30 minutes. In the summer, it will still happen, but not as quickly. If I find it in time, the best way to warm the kit is to place it in the kindle and the bunny will be its toasty self in about 30 minutes or less. One of the other smaller ones got outside the nest being dragged out while it was nursing. So, we lost two and I still had to hand feed the last of the small ones some mornings when he was not getting any milk. He is only about a third of the size of the largest, but when they are about ten to twelve days old, they begin to open their eyes. This is their cutest stage with their ears finally lifting as they peek at the world. They then can get into and out of the nest, although they like being in it better for a few more days and if it is cold. At this point, I do not have to be so concern about them getting the milk they need and the small one will catch up. Usually, once their eyes are open, we do not lose any more but have been the rare exceptions and this time was one of them. One of the bunnies had its back leg snared in the wired mesh floor and had broken it. This is only the second time this has happened in the two years we have had the rabbits. The first time I had to free the bunny's leg myself and this time my husband found it. The first one had tore up the leg badly and circulation was its problem so it needed to be put down. This one we are waiting to see if the foot swells or discolors as it does not seem as badly damaged. After that another one climbed out of the cage, which has never happened to us before once their eyes are open and just a few times when their eyes are still close. I found it lifeless in with the rabbit waste. So now we are down to seven and one is iffy with his injured leg. Usually we do not have so many problems, but every kindle is different. We had one kindle where half of the blind babies were climbing out of the cage until they opened their eyes and even though a few needed cleaned up, all but one survived the falls and being in the rabbit waste and the chilling of not being in the nest. We had one kindle that just never came out of the nest even to the point that they were so big they did not all fit anymore and seemed lost when we took it out. That kindle did everything at the same time as if they were psychically connected. I know that many of my friends wonder how we can process and eat rabbit meat after handling some of those bunnies. We have sold some as pets and breeders at times, but honestly once they are full grown, they are quite large, difficult to handle, and not all that cuddly. Rarely does the smallest one grow up to be the smallest adult and they all look pretty much alike, so I lose track of who is who. The meat is very good, like chicken but less fat, which means adding oil is necessary in most preparations. I just found an organic rabbit food and a local distributor for it, so we are going to give it a try. I have been concern about GMOs in rabbit feed and we simply do not have the land necessary to grow our own rabbit food. However, we do supplement them with things from my gardens and they seem to think rolled oats are rabbit candy.